Kuala Lumpur, July 2016 – Adapted from the famous awards winning TVB Drama Line Walker使徒行者, the movie of the same name is set to be released in Malaysia on 11th August 2016. Here’s some of the info which you might be interested to know regarding the movie. 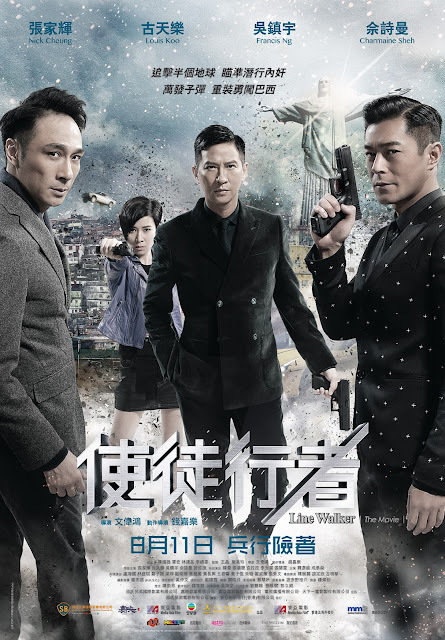 When undercover agent Ding丁小嘉 (Charmaine Sheh佘詩曼) receives an encrypted message from Blackjack, who claims to be an undercover agent that has lost contact with the police, she reports it to her superior officer Inspector Q (Francis Ng吳鎮宇), who immediately launches a mission to search for Blackjack. During the mission, Ding visits a casino where she discovers that the supposedly dead triad leader FoonHei (Benz Hui 許紹雄) is still alive and kicking. Spinoff from a successful TVB Series! Line Walker is the spinoff of the eponymous 2014 TV series by TVB. The series tells the story of undercover cop Ding and her quest in search for missing undercover agents in the criminal world. As she traverses through a world filled with distrust and betrayal, every step could be her last. Every episode Line Walker is an exercise in the art of defusing crises. The suspenseful close calls and the riveting mystery kept audiences at the edge of their seats for 30 episodes. Speculation over the identities of the missing undercover agents became the talk of the town, making the series the highest rated TVB drama of 2014. The story’s intricately crafted characters were brought to life by a brilliant ensemble cast. The show garnered a total of five prizes at the TVB Anniversary Awards, including Best Drama, Best Actress (Charmaine Sheh), Most Popular Male and Female Characters, as well as Most Popular Theme Song. A key member in a multi-nation drug syndicate, Lam is an intelligent criminal with an IQ of 140. He takes caution in every act, but he is also ruthless and willing to do anything to get what he wants. When he discovers that Shiu Yeah (Louis Koo), his right-hand man and confidant, is trying to take over his drug business, he uses everything in his power to stop it, angering the ambitious Shiu Yeah. Lam’s right-hand man and best friend, Shiu has a wide network of contacts that offers him first-hand intelligence and earned him great deal of success in the syndicate. Despite his achievements, he is unable to surpass Lam and never considered to be more than a right-hand man. He hopes to finally make his mark during the Brazil deal in order to pave his way to the top of the syndicate. However, Lam’s resistance ultimately leads to a power war between the two best friends. The head of the Criminal Intelligence Bureau and Ding’s direct superior officer, Q is the brain behind the undercover hunt. He is a calm, silent figure that carefully considers every step. His strength lies in his resourcefulness, and his collected nature has led to decisions that saved the lives of his subordinates in the most dangerous situations. Working side-by-side with Ding, he eventually develops feelings for her. Ding is an undercover cop for the Criminal Intelligence Bureau. Growing up in a tough neighborhood, she can sometimes seem more like a hoodlum than a cop. Forced to constantly walk between the law and the criminal world, she often relies on her wit and intelligence to get out of dangerous crises. When she receives a message by an unknown undercover cop known as Blackjack, she is drawn into another dangerous undercover search operation. A renowned leader of a triad organization, Foon-hei has a complex and murky history. At the end of the television series, he was believed to have been shot and killed. However, the film version sees him make a shocking return as he vows to reclaims his throne at the top of the criminal world. During the leap from television to film, not only did the Line Walker team amass a star-studded cast, it also expanded the story to a global level with a thrilling climax set in Brazil. Over 12 shooting days, the cast and crew basked in the country’s beautiful sun and soaked in the local culture. However, the crew also saw some real-life drama as they faced several close calls with real bullets and the threat of the Zika Virus outbreak. This movie is definitely a film to be anticipated of if you are a HK film fans. Remember to jot down the date of the release. It is on 11th August 2016.